It's that time of year!! Where football, cooler weather (which we are just now getting in Nashville), and fall baking make my life complete. This is also the time of year when people go crazy over pumpkin. I have to admit, there were a couple of weeks that I went crazy trying to find it. It was nearly impossible. I checked everywhere, even in two different time zones! Then one day last week I get a call from my husband. He tells me that he went to a local grocery store and miraculously found some pumpkin and bought the last 7 cans on the shelf. Call me crazy, but I think that was one of the most romantic things he has ever done for me! You see, I didn't ask him to go and hunt for pumpkin, he just did...on his own. Of course, he may have done it knowing that he would reap the benefits by enjoying all the things I had planned for the pumpkin, but still, it was the phone call that made my day! I couldn't wait to make these pumpkin blondies. First of all, I love brownies, blondies and basically any baked item that is in bar form. With pumpkin in the recipe, I knew they would be delicious and moist and the cinnamon, nutmeg, and cloves crank up the fall flavor. Plus, they also make the house smell incredible while baking. Preheat oven to 350 degrees. Line bottom and sides of a 9-by-13-inch baking pan with foil, leaving an overhang on all sides. In a medium bowl, whisk together flour, spices, baking soda, and salt; set aside. With an electric mixer, cream butter and sugar on medium-high speed until smooth; beat in egg and vanilla until combined. Beat in pumpkin puree (mixture may appear curdled). Reduce speed to low, and mix in dry ingredients until just combined. Fold in white chocolate chips. Spread batter evenly in prepared pan. Bake until a toothpick inserted in center comes out clean, 35-40 minutes. Cool completely in the pan. Lift cake from pan (using foil as an aid). Peel off foil and cut into bars. I had the privilege of tasting these and they were fabulous! So moist and a nice taste of sweet from the white chips. I could eat the whole plate of them! They sound AMAZING. I am like you and LOVE fall and all that goes with it. Let's hope there's more cans of real pumpkin out there for the rest of us to buy and try your recipe. Oh YUM!! I found two cans tonight. This is definitely worthy! I love white chocolate and pumpkin together! Yum! Yum! This is definetly worth making. 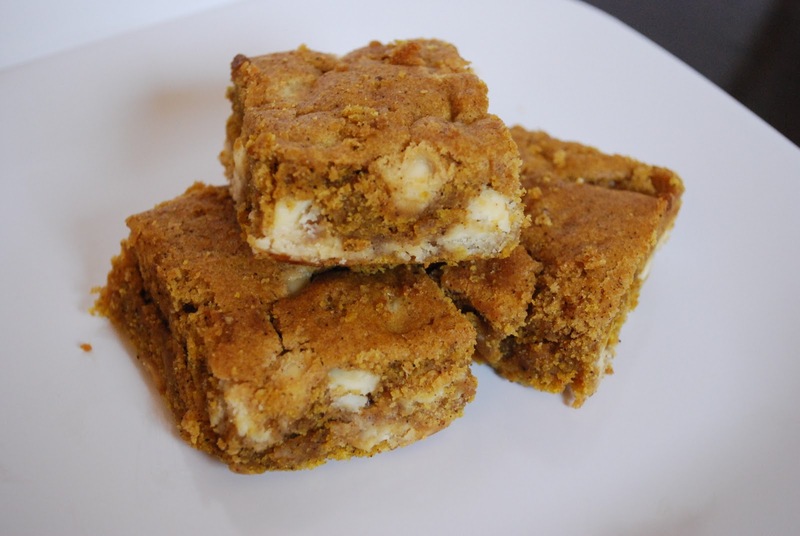 I love pumpkin and blondies! What a nice husband! My husband does not like pumpkin at all, so I doubt he would go searching for me! These look delicious!